- Are You Married or Happy by Nicky D.
- A Piece of Cake by me. - Check out this amazing goal by Marco Matias of my favorite British soccer team, Sheffield Wednesday. - Did you know the Steelers have a team chaplain? Did you know his name is Ocho Cinco? Well, actually it's Chad Johnson, but not that Chad Johnson. Here's a fun quote for those of you upset about the Steelers signing Michael Vick. 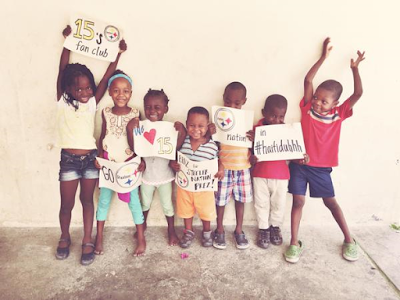 Winning is important and the NFL is a business, but the Steelers have values beyond that. "It is part of the Steelers' core values. Coach Tomlin is such a phenomenal person beyond football and such a caring man. He is about the business in raising young men. That is the rarity in him. He really cares about these guys beyond football and they can feel that." Johnson said. Johnson's work is an extension of the Steelers mission. - Finally, Lisa Kudrow joined Taylor Swift to perform "Smelly Cat." The Philadelphia Phillies recently traded 6-time All-Star and 12+ year veteran Chase Utley to the Los Angeles Dodgers. To thank the fans, Utley purchased ads in two Philadelphia newspapers to express his gratitude. 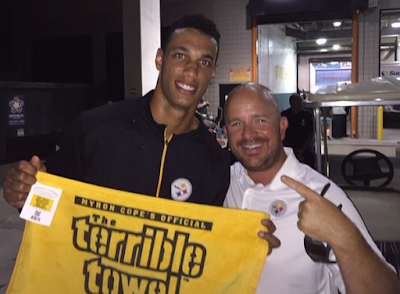 I'm mentioning this because the Pittsburgh Steelers placed WR David Nelson on the team's Reserve/Injured List on Tuesday. Nelson spent time with the Buffalo Bills from 2010-12 and the New York Jets from 2013-14 before signing with the Steelers and played with the team for slightly more than 12 days. Since Nelson doesn't have the resources that Utley has and didn't have the tenure in Pittsburgh like Utley had in Philadelphia, instead of purchasing an ad in the Pittsburgh Post-Gazette or Pittsburgh Tribune-Review, Nelson is saying thank you here on Sean's Ramblings. for the opportunity to play for this terrific franchise. Thank you to the Rooney family, Kevin Colbert and coach Mike Tomlin for giving me this chance to continue my NFL career. Thanks to the fans for realizing that I was not Jordy Nelson or Edmund Nelson, the former Steeler that worked as a color analyst for KDKA on the Steelers pre-season games prior to this season. I mean, I don't look anything like Edmund Nelson, so why did Frank from North Versailles and Joe from Dormont call me Edmund? I'd like to thank my teammates and particularly my wide receiver compatriots. No, using the word compatriots doesn't make me a New England Patriots fan. Antonio Brown is the best receiver in the NFL, and I wish I had the chance to talk with him more to learn how he got those amazing abs. Markus Wheaton, DHB and Martavis Bryant are also class guys. Heinz Field is such an incredible atmosphere. I mean I've seen it on TV and it would have been cool to have seen it as a member of the Steelers. Maybe the team will give me a souvenir Terrible Towel and let me wave it from a luxury box. 50-yard seats? Okay, the top level of Heinz Field is fine. Finally, I hope that you will support my i'mMe Foundation, a non-profit organization on a mission to end the orphan cycle and change the lives of children. We have done important work in Haiti, and our mission is to bring the sustaining and empowering structure of family to the orphans of the world through care, prevention, and stewardship. Please check out our website at imme.org and follow the organization on Twitter. Thanks again, Pittsburgh and Steelers fans across the globe. Please follow Sean's Ramblings on Facebook. I mentioned last week that I'm now part of The Learned League, so for today's Trivia Tuesday, I thought I would share some questions from my first week plus in the league. 1. 2001 Odyssey, located at 802 64th Street in the Bay Ridge neighborhood of Brooklyn, was the setting for pivotal scenes in what iconic film? 2. JSE Limited, a major stock exchange which is its country's (and its continent's) largest as measured by market capitalization, is located in what city? 3. What is the only national capital city in the world which borders two other sovereign nations? Its border with one of them, for ~46 years, also formed part of the Iron Curtain. 4. In 2007, the newly refurbished Iffley Road Track in Oxford, England, was renamed for what man, honoring an event 53 years prior? 5. The first human spaceflight program managed by NASA had what name? It ran from 1959 until 1963, with an express goal of sending a solo human into Earth orbit and returning him safely before the Soviet Union. 6. 72% of the liquid natural gas (LNG) imported into the U.S. comes from what Caribbean twin-island nation which, due largely to its petrochemical and industrial economy, is, by per capita GDP, the third-richest country in the Americas after the U.S. and Canada? 7. What was the name of the original British television series, running from 2001 to 2003, which was first adapted in Poland as Idol, and later in the U.S. as American Idol, in France as Nouvelle Star, in Australia as Australian Idol, and many others? 8. What is the traditional English translation of the name of the Tuscan port city of Livorno? The term is used for the breed of chicken which originated there and was introduced to North America in the early 19th c. (and, by extension, the name for a famous fictional fowl). 9. What is the essential ingredient in any dish described as florentine? 10. Among the four Carnegie Museums of Pittsburgh is one which purports to be "the most comprehensive single-artist museum in the world." For what American artist is this museum exclusively dedicated? Of these questions, I got 5 of 10 correct. Can you do better? Please leave your answers in the comments section below and don't use the internet for assistance. Good luck! This is a very busy time of year. There is much to do to prepare for the start of the school year with my family and deadlines at work. There are other things that rank just as high in importance though. I think I'm in 4 or 5 leagues again this year, but I don't even know. I do know that I can't find a draft time that works for everyone in the league where I'm the Commissioner. This is a problem. Oh, my current draft plan consists of getting Willie Parker as a sleeper pick. I've had a really good run in this contest to select 10 TV shows that won't make it to the next TV season. I won in 2011 and 2013 and finished near the top in 2012 and 2014. This may be my calling. Unfortunately, I really don't have a feel yet for the new shows or what shows are ending after this season like Parks & Rec, Glee and Two and a Half Men last season. While I'll probably have another blog post about the 2015-2016 Ted Marshall Open, you can enter now until Labor Day. This is supposedly the trivia league of all trivia leagues. It's an invitation-only league that was even featured in The Washington Post. After seeing the difficulty of the sample questions, I predicted that I would finish last. I mean, there's lots of useless knowledge in my head, but less useless knowledge than the people I expect to be in this league. After three days, my prediction isn't that far off as I'm in 28th place out of 30 teams in my rookie division. However, I rank first in Correct Answers Allowed, meaning the total number of questions answered correctly by opponents in all matches. Basically, I've played the hardest schedule of the 30 teams. I'm also tied for first in the Most Common Wrong Answers category, so although I'm answering a lot of questions incorrectly, I'm at least providing some very good educated guesses! We're probably switching our TV provider meaning that we're going to get a new DVR. Now, I have about two weeks to go through as much on my DVR as possible. I should be able to watch the entire first season of Fargo, but I don't think I'm going to get to Silver Linings Playbook, The LEGO Movie, Captain Phillips, 42 and so many other movies. Yes, this entire post could be part of The Steel Trap's next First World Problems post. 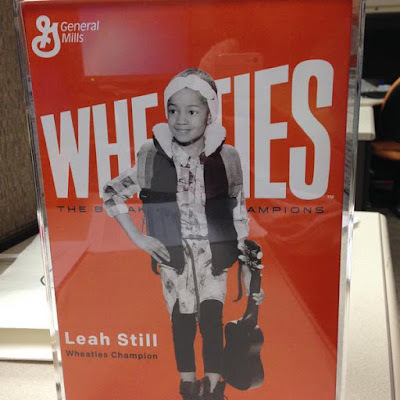 Leah Still, the inspirational four-year old cancer survivor and daughter of Devon Still of the Cincinnati Bengals, is getting her own Wheaties box. This is very cool. So cool that the Washington Post Express included a note about this in Thursday's Blog Log. One problem...Leah Still's name is Leah Still not Leah Strong. Her dad is Devon Still, not Devon Strong. Express noted that this was from a Mashable article though I checked and Mashable definitely referred to Leah and Devon with their correct last name. So close. Click here for more Express Fail posts. Dale Lolley is the Pittsburgh Steelers beat reporter for the Observer-Reporter of Washington (PA) and has been in this role since 1993. According to his bio, Lolley previously worked at WJAC-TV and the Tribune-Democrat in Johnstown and The Derrick in Oil City. In addition, Lolley earned a degree in journalism from the University of Pittsburgh at Johnstown. He also serves as the administrative adviser for Washington & Jefferson College's student newspaper. Based on his approximately 25-30 years of writing professionally, you would think that Lolley would have an amazing grasp of grammar. Or not. Join Benz and I? Take out the Benz part and see how that sounds. Join I on 970ESPN right now from 7-9. Yeah, that doesn't quite work. Now I realize that Twitter is not the place to go for proper English grammar, but this seems rather amateur for someone that writes for a living. After my summer program at Lancaster University ended, I had the opportunity to travel for another week before I returned home, so several friends and I decided to go to Paris. Sure I saw the Eiffel Tower, Arc de Triomphe, Versailles and the McDonalds around the corner from Versailles, but today, I'm writing about visiting (or not visiting) some of the greatest art museums in the world. The Louvre is perhaps the best known museum in the world, built specifically for the movie The Da Vinci Code starring Tom Hanks. There was a huge line to enter, but of bigger concern for me was the giant backpack I was carrying. I couldn't enter The Louvre with it and there was no place in or around the museum to store it. So instead of going inside to see Mona Lisa, I found a park bench near the museum and read the recently released fourth Harry Potter book, Harry Potter and the Goblet of Fire. While probably not as well known as The Louvre, Musee d'Orsay may be the best art museum in the world featuring the Impressionists Gallery and much more. According to Trip Advisor, visiting this museum ranks #1 of 1,170 things to do in Paris. Unfortunately, I don't think Trip Advisor was around in 2000. Fun fact: Did you know that Musee d'Orsay is closed on Mondays? I didn't either when I tried to visit on a Monday and left Paris on Tuesday morning. A museum that I actually entered! Go me! Plus, I'm the only person in history to "think" of taking a picture like this. Fun fact #2: I just bought this exact same orange shirt at Kohl's over the weekend. - Virginia had no sales tax on clothes this weekend, so I ventured to Kohl's with dozens, if not hundreds, of my closest friends. After trying on probably eight pairs of pants, I settled on exactly one pair along with a few shirts. Then, I ventured upstairs to buy some kids' clothing. I happily found 3 pair of size 4 boys pants. 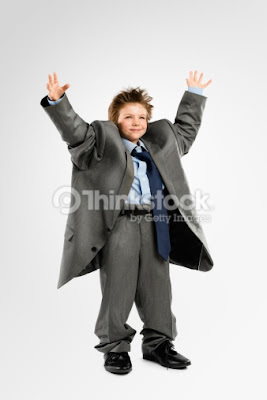 They seemed a little big, but I figured that my older son would grow into them. Apparently, the growing into them could take a long time. I needed to buy size 4T pants not size 4. Who knew there was a difference between the two? I later returned them to Kohl's but did not stay to search for 4T pants. I had my fill of shopping for the week month day. Of course, the Men's Wearhouse guy offered to sell me two suits for $500. I declined. - Another weekend highlight was my driver's side car window going off track. I was able to close the window but now it won't open. You can hear the power window mechanism trying to work, but the window doesn't move. I called the dealership to get an estimate, and they believe that they need to replace the regulator. (Who knew there is a car part named after the legendary Warren G song?) The estimated repair cost is $491 or the cost of two suits. I guess I'll just open my car door if I go to a fast-food drive-thru or ATM or when exiting the Metro parking garage. - My 4 year-old could be a photographer one day judging on how much he likes taking pictures with my phone. This picture of Ziggy came out rather well. Of course, then there are dozens of pictures of the TV and floor like this one of the remote, so he still has some work to do before becoming the next Ansel Adams. - If you're a fan of all Pittsburgh sports, I hope that you watched the Pirates regular season game on Sunday evening rather than the Steelers pre-season game. The Steelers didn't even play Ben Roethlisberger, Antonio Brown, Le'Veon Bell, Maurkice Pouncey, James Harrison, and Martavis Bryant. Meanwhile, the Pirates scored 9 runs in the 7th inning to defeat the Dodgers 13-6. Naturally, I fell asleep with the Dodgers leading 5-1, so when I later woke up to see the Pirates leading 12-5, I was shocked. Let's Go Bucs! Pretty cool. There's just one big problem. There is no section 31 at Nationals Park. There is no Row MS at Nationals Park either. Plus, why are both of my tickets seat #1? 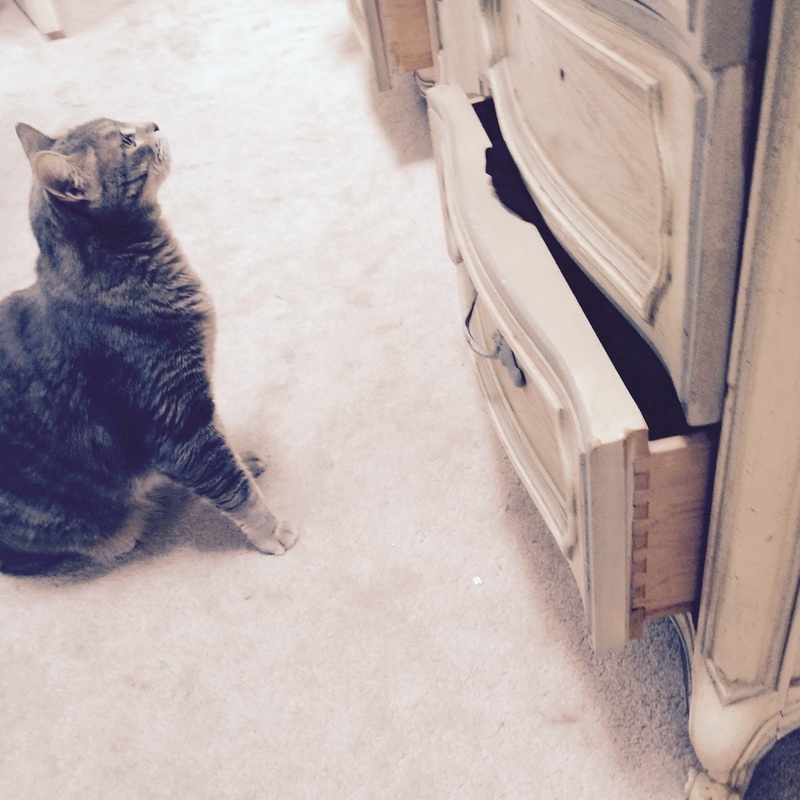 We can't both be in the same seat. If we were, I'd hope the Nats would only charge me for the price of one ticket (especially since my 4 year-old sat on my lap for probably 7 of the 9 innings). I'm sure that you're thinking, wait, am I in the right place? I used to visit Sean's Ramblings often, and I remember that he posted Trivia Tuesday posts regularly. While I'm not promising that we'll see Trivia Tuesday as a weekly feature again, at least for today, Trivia Tuesday is back. Your challenge is to answer the ten questions based on the pictures (and questions) below. For those of you new to Trivia Tuesday or even those that are not, please do not use the internet for assistance. Leave your answers in the comments section below. Good luck! This quiz is courtesy of the fine folks at Pub Stumpers. I watched a lot of wrestling when I was in middle school/junior high. Hulk Hogan, Andre the Giant, Jake "The Snake" Roberts, Ricky "The Dragon" Steamboat, The Junkyard Dog, The Ultimate Warrior, The British Bulldogs, King Kong Bundy, Hacksaw Jim Duggan and so many others including Rowdy Roddy Piper who passed away on Friday at the age of 61. Despite attending several WWF matches at Pittsburgh's Civic Arena, watching some early Wrestlemanias via my friend's parents getting them on Pay Per View and even watching the Saturday morning WWF cartoon, for no apparent reason, the thing I remember most about Rowdy Roddy Piper is this one line (at around the :40 second mark below) from Land of 1000 Dances performed by WWF wrestlers. I always thought this was a silly line. Is calling someone a yo-yo really an insult? I also had in my mind the perfect comeback for Hogan. He could have said that Piper's Such a Diaper. Of course, that makes just as much sense as calling someone a yo-yo.